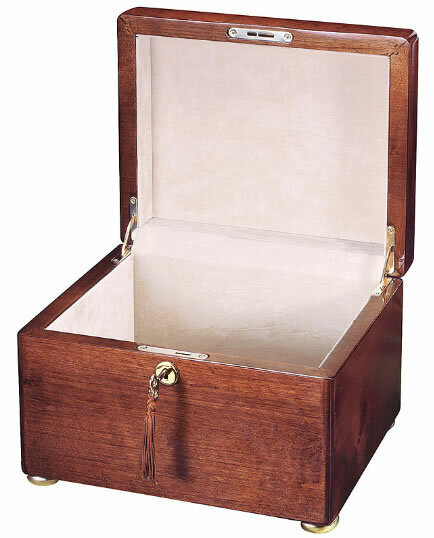 A beautiful Cherry memorial chest urn featuring a Windsor Cherry high-gloss finish on hardwoods and veneers, with contrasting inlaid burl veneer on the lid and a velvet lined interior. The lid opens easily with brass hinges. Brass feet and a brass finished key with decorative tassel complete the urn. Interior Measurements: 8 1/2" Wide x 6 1/2" Deep x 4 3/8" Tall and has a volume of 270 cubic inches if you do not use an insert. 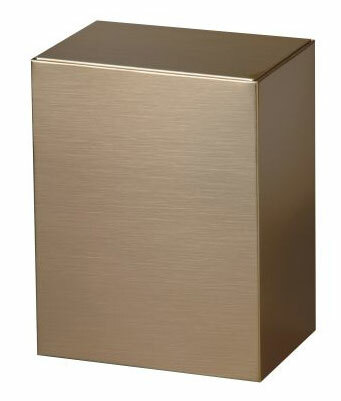 Insert Dimensions: A bronze-finished metal container may be purchased to fit inside the chest. Volume is about 235 cu in and measures 8 1/2"W x 6 1/2"D x 4 3/8"T.
Please note that the bronze inserts have locking lids that once closed are permanently sealed. Any cremains container can be used if it measures no bigger than 8 1/2" W x 6 1/2" D x 4 3/8" T.
An enclosed request card is included. If you return the card, you will receive a free 3"(L) x 1"(H) brass name plate, engraved with the name and dates you specify. Engraving is limited to two lines of block lettering.